When IAVM comes to Chicago for VenueConnect in 2019, there will be a new artistic look to the area. MPEA and the Chicago Department of Cultural Affairs and Special Events, in partnership with area cultural organizations, announced the City’s newest Cultural District adjacent to McCormick Square. The announcement accompanied the unveiling of the newest art installation, “The Bots,” with MPEA CEO Lori Healey and Department of Cultural Affairs and Special Events (DCASE) Commissioner Mark Kelly in attendance. The installation of “The Bots” was designed by New York-based David Weeks Studio in collaboration with Chicago-based Anderson Miller, Ltd., and manufactured at Chicago-based Vector Manufacturing. 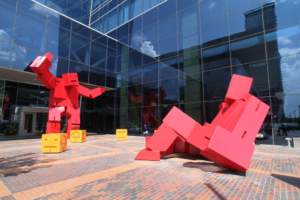 David Weeks Studio is the designer of the famous Cubebot toy and this installation is the largest “Bot” design to date. The standing Bot is 23 feet tall with a 23-foot wingspan, while the reclining Bot is 16 feet long. The giant installation kicks off the neighborhood’s Cultural District, adding to the more than 100 pieces of public art on campus. The new Cultural District will feature more art than just “The Bots.” Starting August 15, McCormick Square will be the site of “Rooted In Greatness” a first-of-its-kind video art exhibit. Working with Luma8, chaired by Lou Raizin of Broadway in Chicago, “Rooted in Greatness” celebrates Illinois’ Bicentennial with video biographies of notable Illinoisans projected into the trees at the corner of Cermak and Calumet. The installation will run through February 2019. With a commitment to public art on campus and a long-standing foundation of art and culture in the area, the Cultural District is a new epicenter of arts and culture. Attracting millions of visitors each year, McCormick Square brought $1.6 billion in economic impact in 2017.